Welcome to my new Bentwater on Lake Granbury weather web site. I hope you will appreciate the weather information found here. The Lightning Detection page has been activated, please check out the Lightning Map Information page first so that you can better understand the information on the Lightning Detection page. Please check back here for progress updates. I would like to hear your comments about layout and content, especially if you use a browser other than Firefox or IE8. Please select the ABOUT - COMMENTS tab to use the form to send me your comments. The weather station is located on Wills Way Dr. in the community of Bentwater on Lake Granbury, on the northeast side of Lake Granbury. 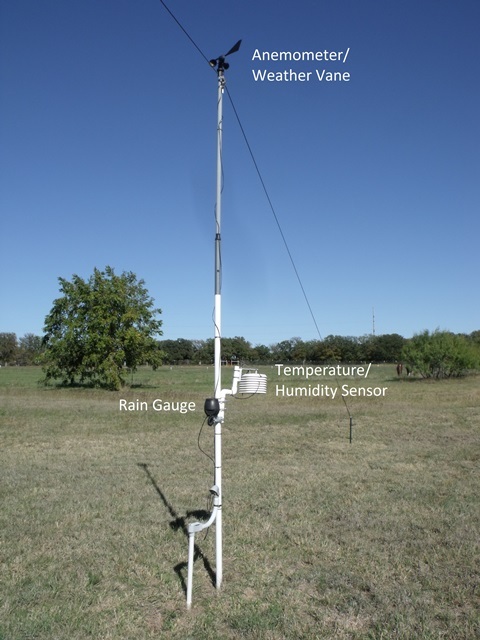 My weather station consists of a Peet Bros. Ultimeter 2100 with temperature, humidity, wind, and rain sensors. The data is gathered continuously on a dedicated homebrew PC with an AMD Sempron Sargas 140 processor at 2.7 GHz and 4 Gigabytes of RAM running Ambient Weather® Virtual Weather Station, a Boltek StormTracker PCI lightning detector card with Aninoquisi Lightning/2000 software and uploaded to this website every 5 minutes.